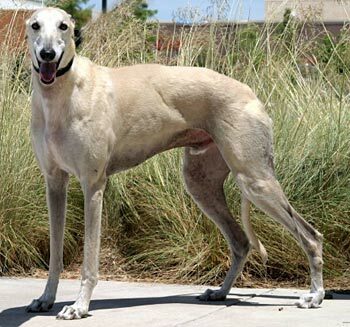 Alex is a 7-year-old light fawn male born in November 2001. Alex has 11 races to his credit in both Texas and Florida. He then went on to help other dogs by being a blood donor. Alex is an easy-going, laid-back boy, and will make a great addition to most any home. When Alex arrived he was having chronic ear infections. Dr. Christy Soileau of VCA Preston Park Animal Hospital evaluated Alex, and referred him to Dr. Dana Liska of the Animal Dermatology Referral Clinic. An allergy test was performed which showed Alex suffers from Canine Atopic Dermatitis, which is certainly controllable, but not necessarily always curable. At this time Alex is receiving weekly injections which will change to bi-weekly on November 22 for the next 3 months. Alex will be rechecked at the end of that time by Dr. Liska. The majority of these patients are reported to respond favorably within this time frame. It is most likely that these allergy injections will be given to Alex for his lifetime. Alex also has SLO (symmetrical lupoid onychodystrophy), an auto-immune condition. He has started treatment, and will probably need these medications for quite some time. Information about SLO can be found here*. The cost for his current medications is approximately $300 every 6 months. It is not known at this time if Alex is cat tolerant; however, he does not seem to react to small dogs. *Thank you to Dr. Carol Macherey of Grassmere Animal Hospital for allowing GALT to refer to their site. 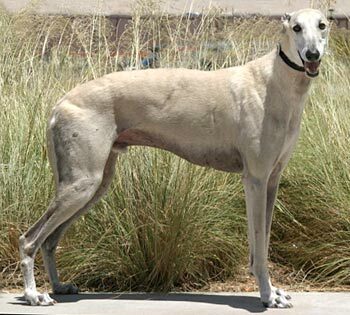 Hopefully everyone has learned the secret by now, but if not - let me tell you – middle-aged and older Greyhounds are the BEST!!!! Alex is 7 years old and is a very gentle soul. If you don’t believe me, just look in his eyes. Although a large boy, he’s exceptionally gentle and quiet (except that he does like the occasional RRRROOOOOOOO-fest with his housemates). He has no space issues and would love for you to lie next to him and pet him while he drifts off to sleep. He’d also be glad to sleep next to you. He’s bummed that fosters are not allowed on the furniture because he would be on the sofa in a heartbeat. To his credit, he is obedient and lies on a dog bed. As I said, he’s a quiet boy. Sometimes you don’t realize he’s around until you feel his head bump your hand. He would stand by you forever and let you pet him. Sometimes I think he’s going to fall asleep standing up. Alex is a very deliberate eater – he knows the value of chewing each morsel. Sometime he also deliberately does not eat a pill that he finds in his food bowl. However, most of the time you can drop his medication in with his food and he’s none the wiser. Giving medication to him takes very little effort. Occasionally he has a burst of energy and grabs his favorite toy (a duck) and runs down the hall with it before throwing it in the air. Maybe he thinks it will fly away if he gives it a start. After such an effort, he must lie down. 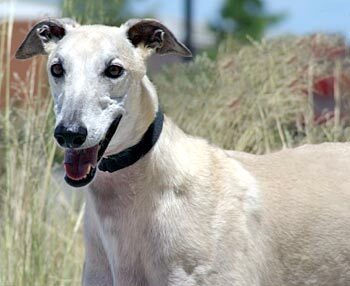 Alex is in a foster home with one female Greyhound and two other male Greyhounds. He fits perfectly – no issues with anyone about anything. He’s housetrained and loves to go for walks, but is also content to chase the squirrels in the back yard or hunt for possums on the deck. For a time he was in a foster home as a single pet and also did well. Alex sounds like the “perfect” Greyhound, doesn’t he?